Let’s talk about the infamous mosquito. For example, whether or not I want to go camping depends on how many mosquitoes are at the campground. Also, if there are too many mosquitoes outside, I don’t want to ride my bike! Mosquitoes like to bite me, so I am careful outside after dark/after sunset. It depends on whether or not they can smell me! Thus, I must wear both a long sleeve shirt and a hat. Sometimes when we are camping, a mosquito flies into our tent. How many mosquitoes there are depends on how close we are to a lake or stagnate water, because mosquitoes live near stagnate water. If you see a mosquito on someone else’s body, you must decide whether or not to kill it. It depends on whether or not that person will thank you or hit you back! ❶ In the title of the blog we used 是否 to mean “whether or not” because titles are considered more formal. 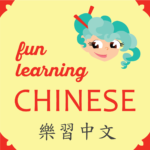 However, in the body of the blog we used 是不是, which is the more conversational, everyday way of saying “whether or not.” Literally it can be translated “to be or not to be,” which is a fun Shakespearean way to remember it! ❷ For this sentence we could have just as easily used the verb 騎 ㄑㄧˊ (qí) meaning “to ride”, but the visual of 踩 “to pedal” faster was more fun. ❸ If you look closely at the characters 太陽下山 you will see that they literally mean “the sun going below the mountain.” Hence, the sun is setting. In the vocabulary list there was the more stark word for sunset 天黑 meaning “day black” or to get dark. 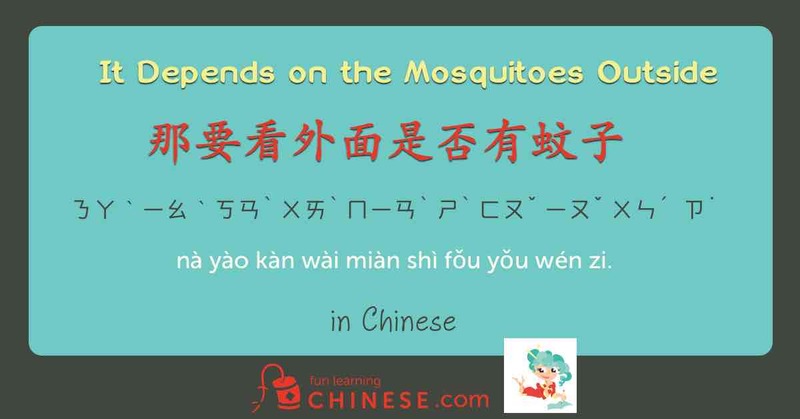 ❹ My tutor says that it is common to use the non-life form pronoun 它 for things like mosquitoes, as a way to both make a point that they are worthless and to make destroying them more acceptable. Unless you are a Buddhist. ❺ 離 is part of the word 離開 and technically means “to leave,” but by extension of that meaning is also used to refer to how far away something is. ❻ The 就 here is for emphasis. “Then” it just depends…. ❼ These are two examples of how another character might be inserted into “it depends” to give a more specific meaning.